Fox- thanks to American Idol- continues to captivate viewers. Idol averaged 29.7 million viewers, spoiling the premiere of The Amazing Race and night number two of Deal or No Deal. NBC did rebound a bit at 10, when Law & Order: SVU handcuffed 13.7 million viewers. The residents of Wisteria Lane may soon be woken up by Tarzan yells. 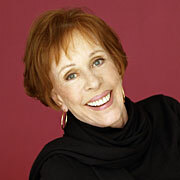 Carol Burnett soon will nab a recurring character slot on ABC's megasuccessful Desperate Housewives. She'll play the cold stepmother of Bree Van De Kamp. Her arrival is tentatively scheduled to air April 9. Hopefully she won't be borrowing any of Eva's outfits.